“I need a vacation from my vacation.” Sound familiar? If crashing and burning is your post-travel routine, you might be doing it all wrong — you need a wellness retreat. We don’t mean a simple spa break — those are a dime in a dozen — but a getaway that targets your specific health concerns through tailored programmes that necessitates nutrition, fitness, therapies and meditation. Most of all, these afford you the time and space to slow down, recharge and refresh your body and mind. Such a Herculean treat requires only the very best, so we’ve picked the ten finest luxury wellness resorts in Asia. It’s hard to imagine anything more invigorating than a stay at Revivo — the word does mean “I’ll live again” after all. Huddled in Nusa Dua’s hills, Revivo’s retreats are anchored on mind transformation to achieve optimal state of being. Check in to a regular three-day programme if it’s bad sleep, weight gain, visible aging or stress that’s ailing you, or have your experience customised to your specific health concern. These are holistic in nature, and encompass nutrition, holistic treatments, and fitness classes. With lavishly-appointed suites with private gardens and swimming pools, menus of fresh and wholesome produce, forest surrounds, the resort has all the trappings of your classic, wellness retreat. Chiva-Som’s Hua Hin is one of Southeast Asia’s most revered wellness destinations. Meaning “a haven of life”, the resort first begun as a beachfront holiday home for its founder Boonchu Rojanastien, before he transformed it into a sanctuary for wellness-seeking individuals. Located on the pristine coast of Hua Hin, the resort is an opulent oasis with myriad fitness facilities, swimming pools and restaurants to complement your stay. Its retreats are personalised experiences that begin with a consultation with a wellness advisor to shape your stay and hang on six wellness tenets: Physiotherapy, holistic health, nutrition, fitness, spa and aesthetic beauty. These cater to a range of needs from the ailment-specific such as migraine-relief, cell vitality for those in remission and tension relief to generic fitness, yoga and spa devotees. The mystical Kingdom of Bhutan consistently ranks as one of the happiest places in the world, cementing its status as the perfect destination for spirituality seekers. Como Uma Paro is a serene landing point for your wellness journey. Perched on a hill overlooking the town of Paro, the property’s clean-lined design of handcrafted stone, wood and tiles instantly puts one at ease for the calm awaiting inside. Check in for its Himalayan wellness discovery experience. Over the course of six nights, you’ll enjoy morning yoga sessions, meditations in sacred monasteries, Ayurvedic treatments, nature hikes and spa therapies. 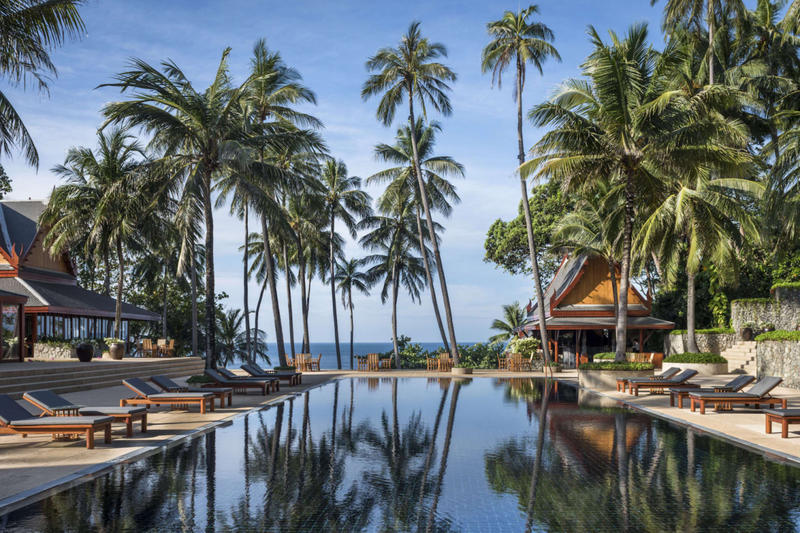 Shed the stress at Amanpuri; translated to a “a place of peace” in Sanskrit script, the sleek resort is located on a private peninsula in Phuket’s west coast. Turquoise waters with palm tree-studded shores surround the property, which takes inspiration from the ancient temple ruins of Ayutthaya. Its wellness immersion programmes span three to 14 nights and address four concerns: Fitness, weight management, cleanse and mental awareness. Every day at Amanpuri is a chance to heal, with guided meditation, spa treatments and nutritional meals essential to the programme. Kicking off your journey is a pre-arrival assessment to create your bespoke stay; regular on-site consultations keep your progress in in check. Lauded as one of the world’s most beautiful destination spas, Ananda Spa is as close as you can get to heaven — it’s situated on the Himalayan foothills in Northern India. Founder Ashok Khanna had one goal in mind for the resort: For it to be a hub of holistic wellness for the mind, body and soul. Surrounded by the mythical Sal forests and overlooking the Ganges river, the property boasts colonial hill architecture and is connected to the restored and resplendent Vicegeral Palace. Take your pick from ten wellness packages — each of these target a different health concern, which ranges from a five-night fitness programme to a 21-day yogic detox, and are tailor-made by nutritionists, therapists and health consultants. Kamalaya is as spiritual as it gets. Koh Samui, the island it sits on, is said to have a sacred energy that enriches and enlightens one’s soul. The property also encircles a monk’s cave, which carries centuries of spirituality and meditative energy. The resort champions the “unfolding of the human spirit”; wellness programmes are meant to deepen one’s inner disposition, detox and counteract stress. One of its most popular programmes is said to be the comprehensive detox, which features herbal remedies and supplements, and colon hydrotherapy sessions. Once day the day is done, float in the rocktop pool villa perched above the coastline, or relax in your penthouse suite with stunning treetop views. More than two years were spent hunting for Santani’s location, and the efforts paid off — the property is a former tea plantation, tucked into an unspoilt forest in Sri Lanka’s spiritual heart. Spread across 48 acres, the resort features deliberately minimally designed and naturally ventilated rooms devoid of televisions; WiFi is only available on demand to reward your mind with the rest it deserves. As its name, which means “in harmony with”, suggests, reconnecting with your soul comes easy here with no distractions and views of a misty, surrounding mountain range. The resort recognises that no two bodies are alike, and curates each package according to your body composition, lifestyle, emotional state and future goals. The wellness experiences are available in a variety, with ayurveda, detox, healthy living, de-stress and yoga as the main ones. There are no strict, regimented routines here — you’re free to choose, seek and thrive however you want. 45 minutes from the ancient city of Borobudur is MesaStila: A twenty-two hectare paradise encircled by eight volcanoes, gardens and thick vegetation. Only twenty-three villas are located on-site, with each paying homage to a bygone era. Some are built to resemble a Javanese antique Limasan, while others are like traditional Joglos. Retreats take on a pampering approach, with massages, hammam baths and calming therapies rostered in a schedule of activities. Those looking for a more intense weight management programme have fitness sessions included, while detoxing involves heat treatments to cleanse the lymphatic system and Javanese herbal remedies to boost your metabolism. One wouldn’t typically think of Ipoh as a wellness hub but The Banjaran Hotsprings proves its naysayers wrong. Nestled amid a deep valley, the resort is blessed with otherworldly surrounds; it’s cradled by 260 million-year-old Paleozoic limestone hills, rainforests, geothermal hot springs, natural caves and waterfalls. Your personal restorative journey hinges on detoxification, longevity, rejuvenation, weight management and fitness. These can vary between two to 21 days, and depends entirely on your needs. Whatever abode you choose, the massive garden, lake and water villas come equipped with king-sized beds topped with rich-linens and thick mattresses, private pools and gardens. Fusio Mia describes itself as the place to be if you’re looking to “lose yourself and find yourself”. Though easily located to three UNESCO sites, its star attraction for the weary is its wellness programmes, which are more than spa holidays. These center on plant-based nutrition; meals are entirely vegan, or almost completely so. Complimentary yoga, tai chi, meditation is included into the package, with each programme inclusive of personal consultation, spa treatments and even a master reiki healing class for longer stays.